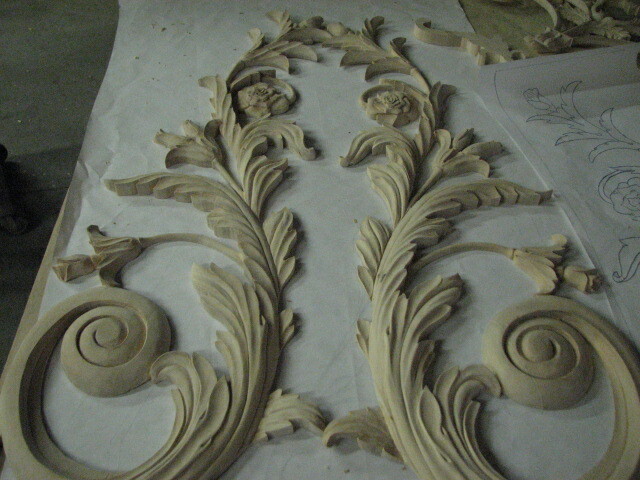 I was asked to bid this job as well as provide some samples of the completed mouldings. 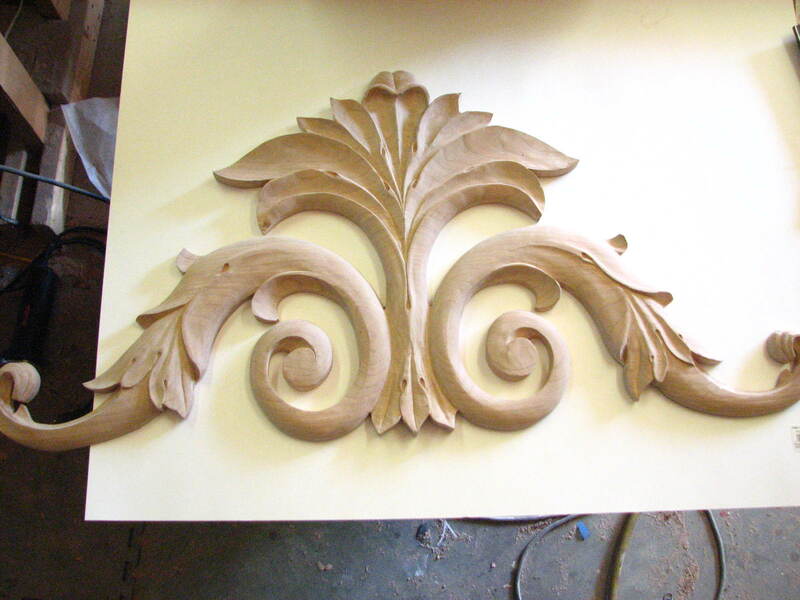 These pieces are in Mahogany and the total job will require 590 ft. of each piece of trim. 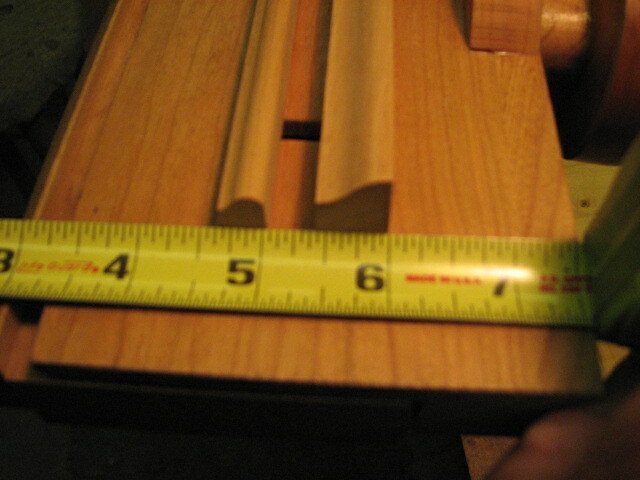 The larger one is 9/16th inch wide and the smaller one is 3/8ths inch wide. 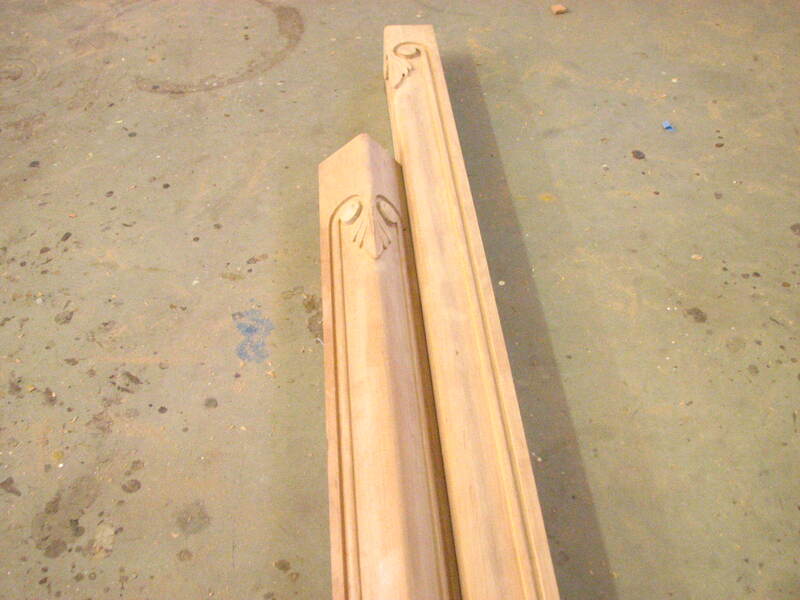 Not very wide as moulding goes but these will serve as trim for custom made Mahogany doors where the moulding will fit into panels in the doors. 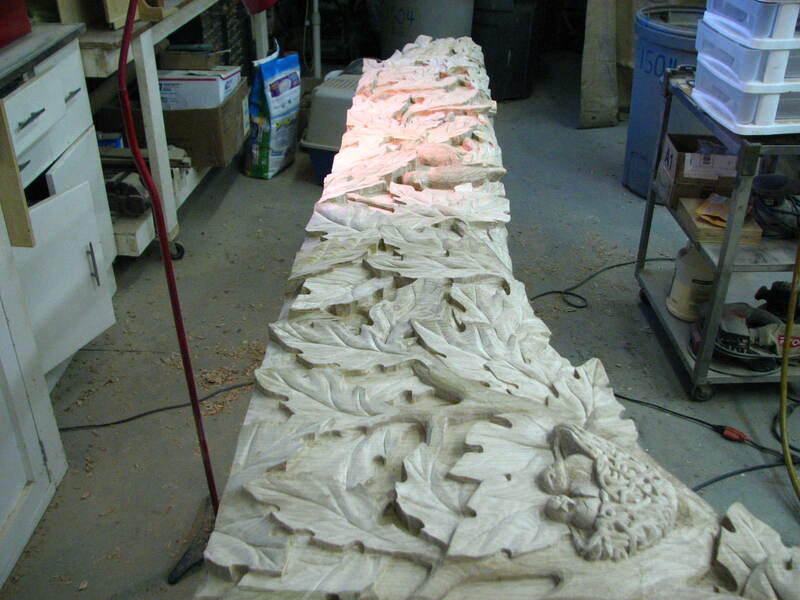 In order to carve pieces like this I needed some way to hold them securely without damaging the pieces and have full access to them when in the process of carving. 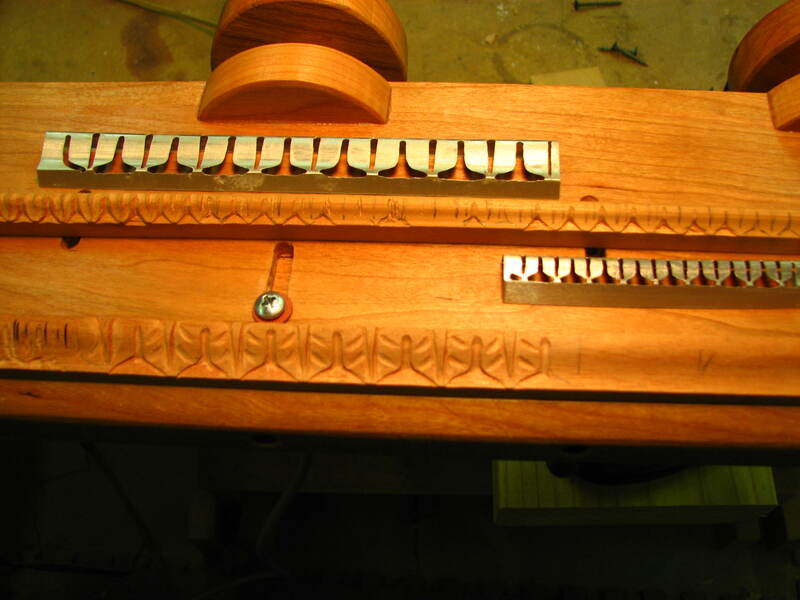 Also I wanted a jig of some sort to hold either piece. I came up with this idea of a vise that would accomplish everything I wanted. It had to be quick to open and close. Hold the pieces securely. 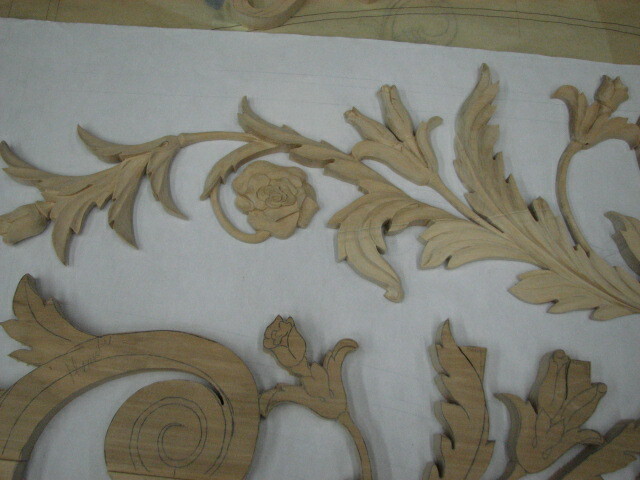 Not interfere with the carving nor damage the finished carving in any way since they are so small and delicate. I used some Cherry stock and made a bed. 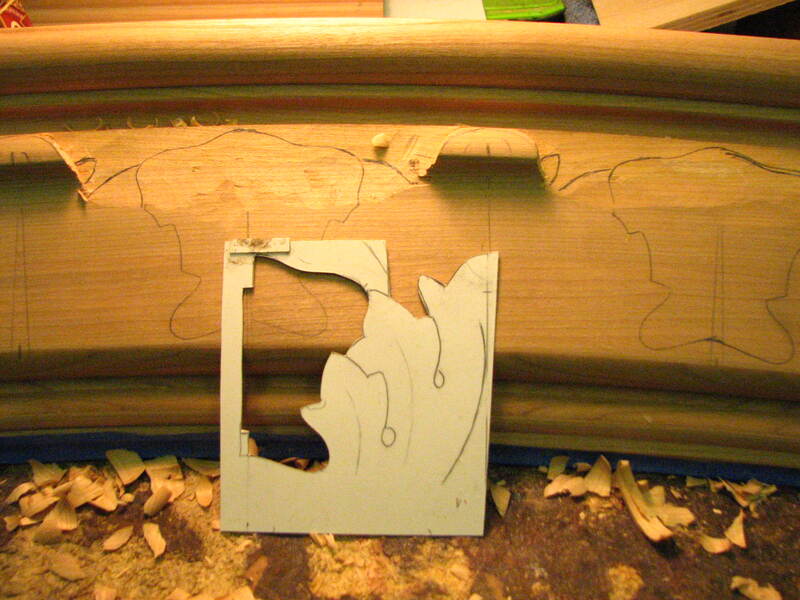 Along the face I added a fence if you will to act as a stop for the moulding to sit against. 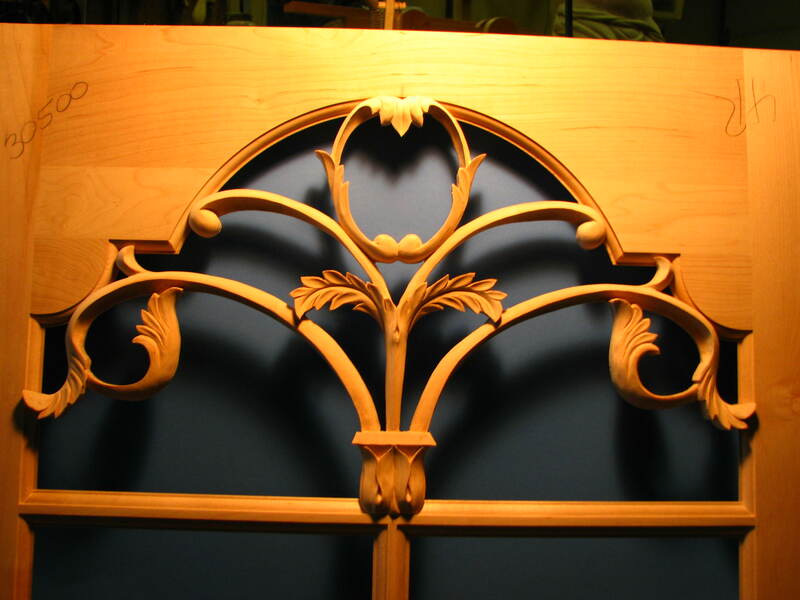 What holds the moulding in place is a sliding table that presses against the back of the moulding effectively pushing it against the fence. A pair of wheels along the back exert the force against the sliding table. 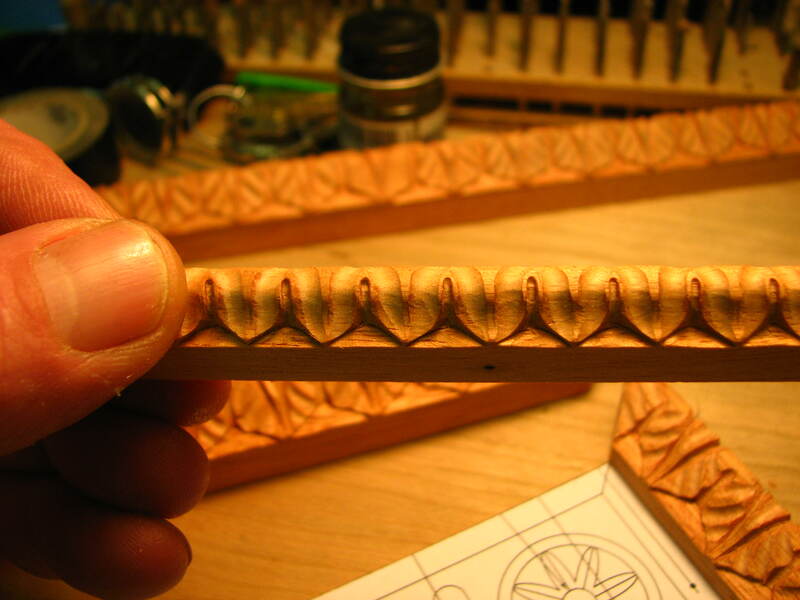 Also for doing repetitive pieces as this moulding is it’s necessary to have a pattern of some sort to rapidly and consistently draw the pattern. 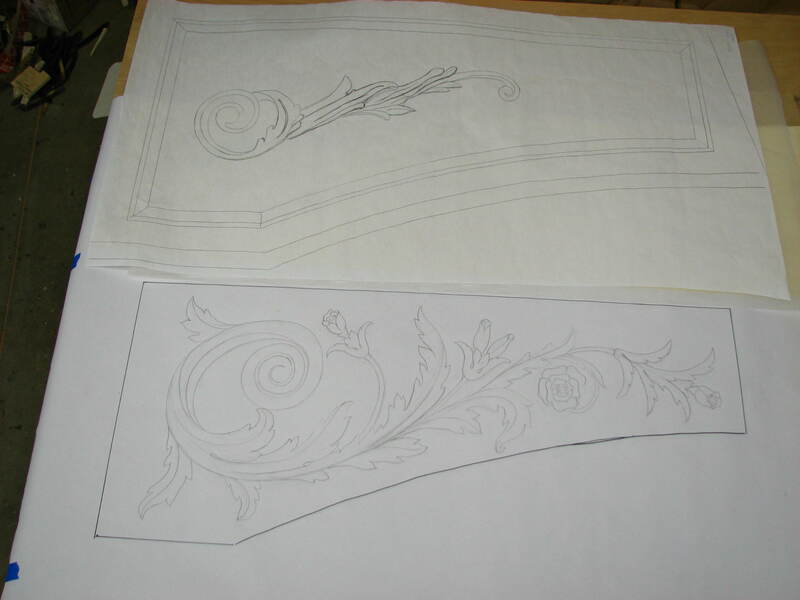 For the lengths needed here or in cases where many repeats are necessary of a design using paper and tracing just doesn’t work at all. 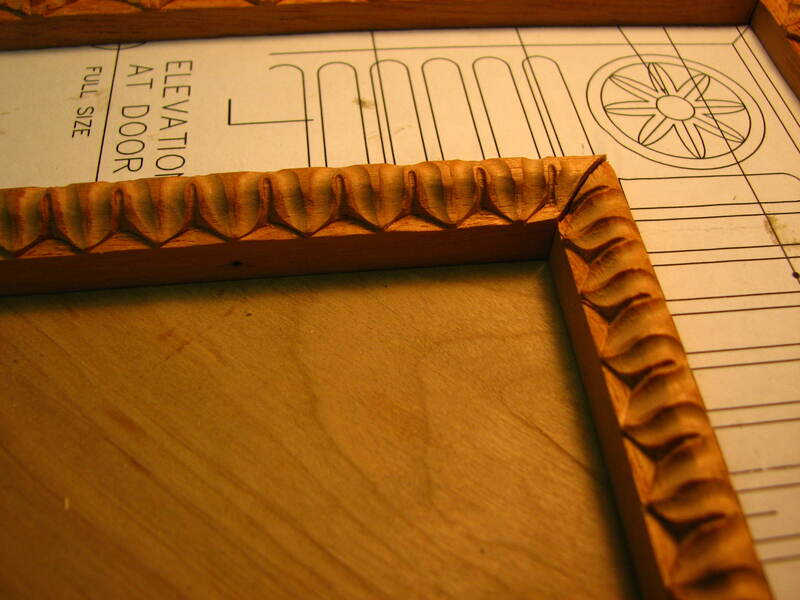 I made these templates for each strip of moulding out of thin sheets of aluminum bent to the shape of the moulding. 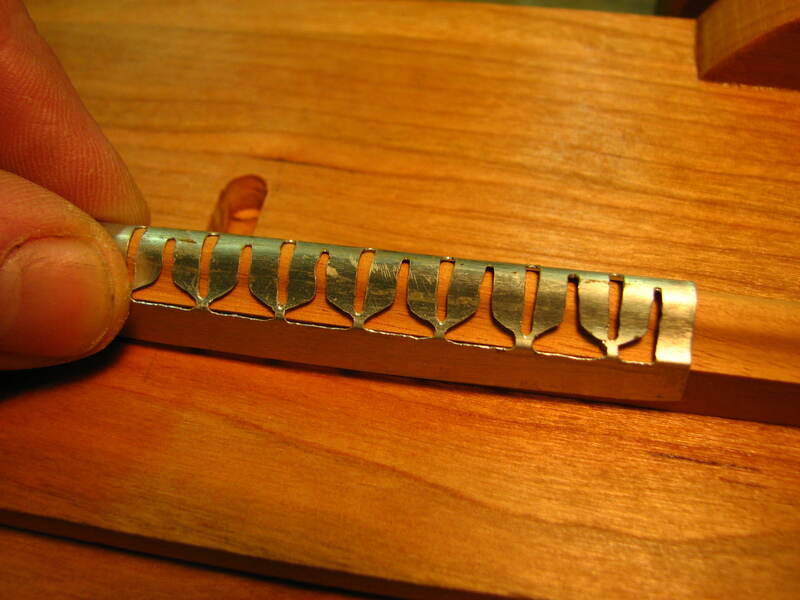 Many times I’ll use chisels to cut them out once the pattern is on the aluminum but in this case since the designs are so small I used a burr to cut out the templates. 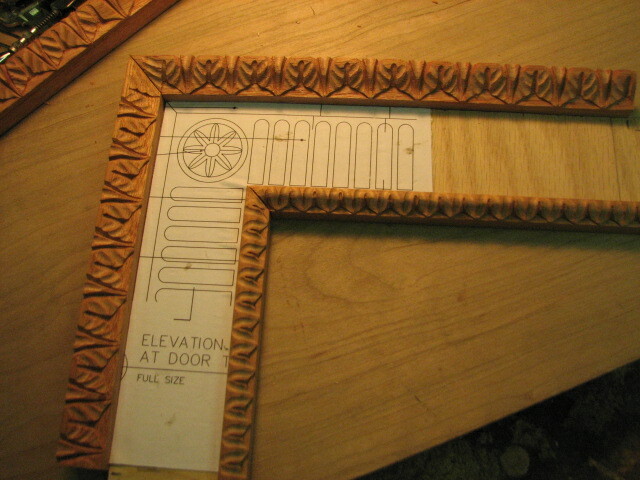 If the template needed will be used on flat pieces instead of moulding for example, I often use the plastic “For Sale” signs. It’s easy to work and holds up well for repeated use. 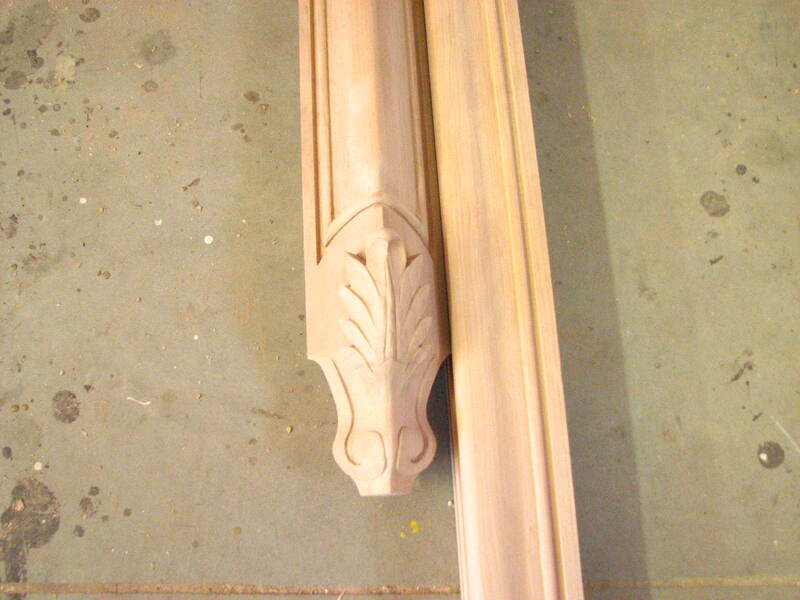 This is the door moulding that will fit into inset panels in the Mahogany doors. 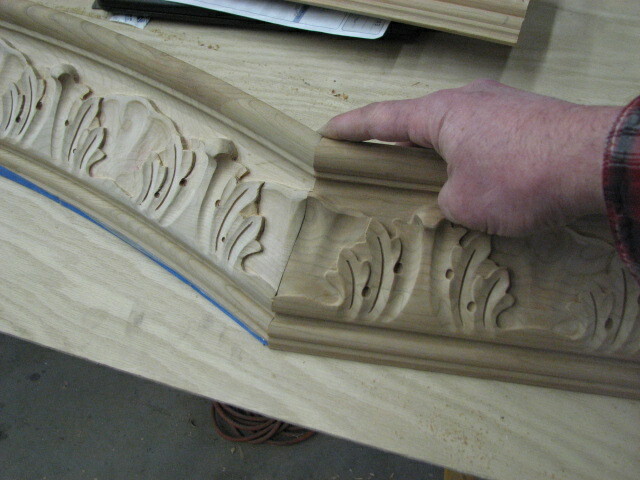 The larger outside moulding is approx. 9/16 and the inner piece is 3/8. 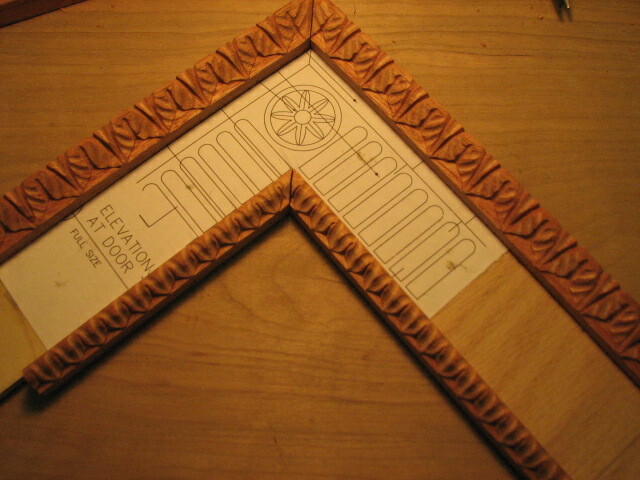 I don’t have to make the section with the flutes or the rosette corner block. 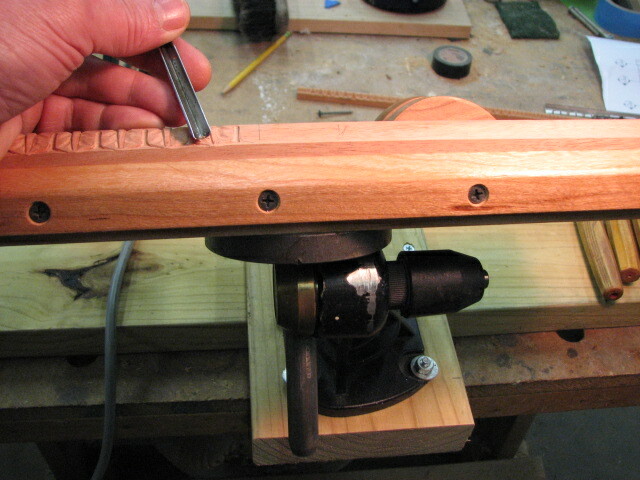 Here is the broken down carving vise I made to hold the mouldings. 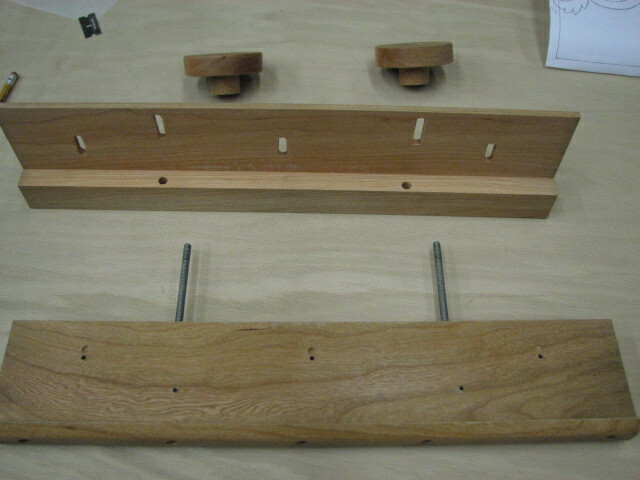 On the bottom you can see the bed with the pair of threaded rods inserted into it. 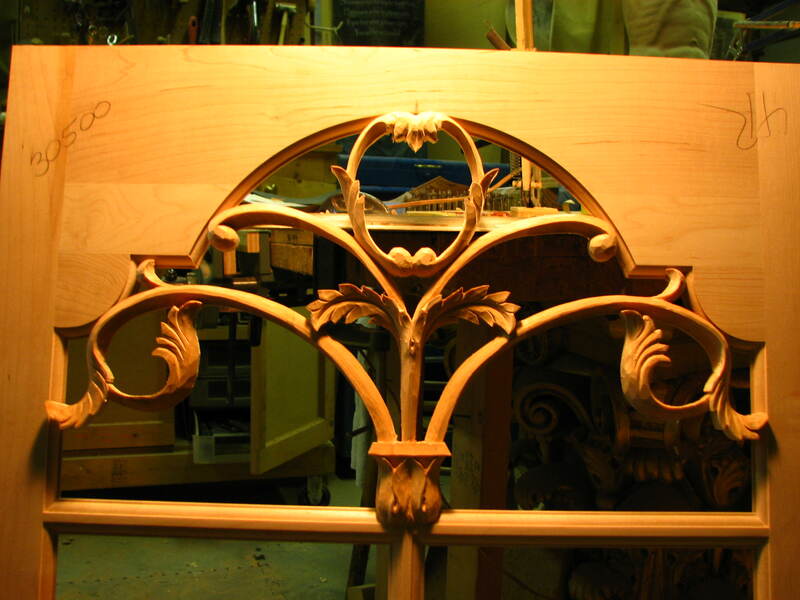 Along the front of this bed is a flange that the moulding will sit against. 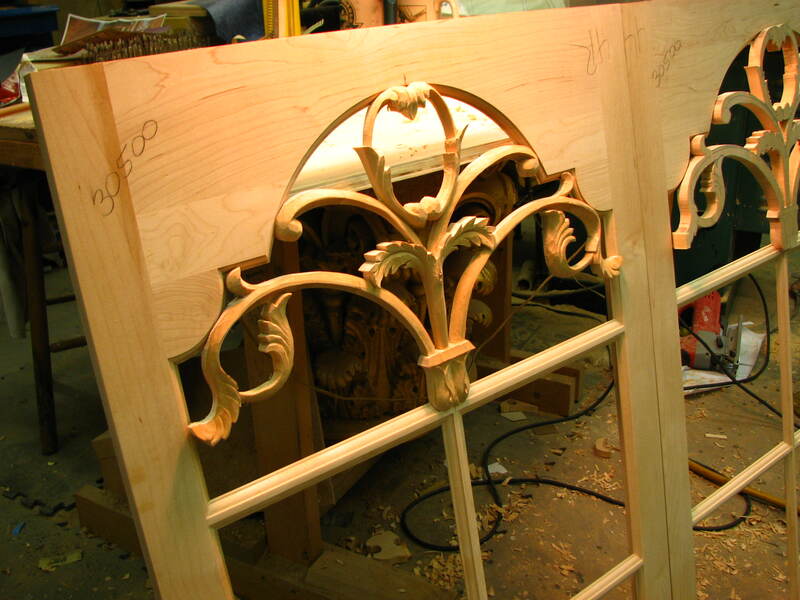 The upper piece is the sliding table that will press against the moulding. 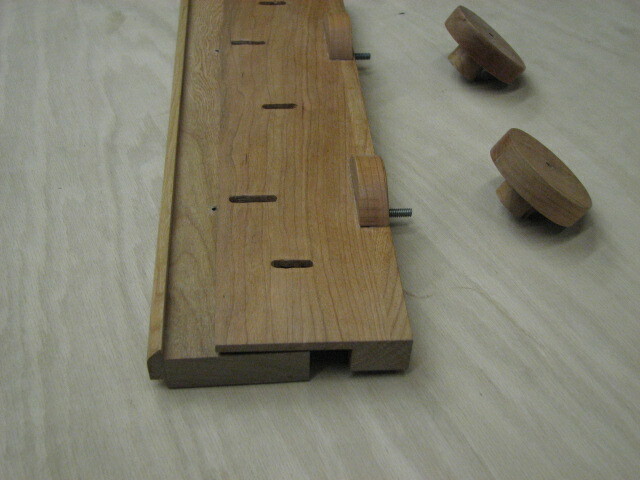 And the wheels with the capture nut inside act as large nuts to provide the force against the sliding table. Here you can see the table tilted up where the threaded rods pass through it. 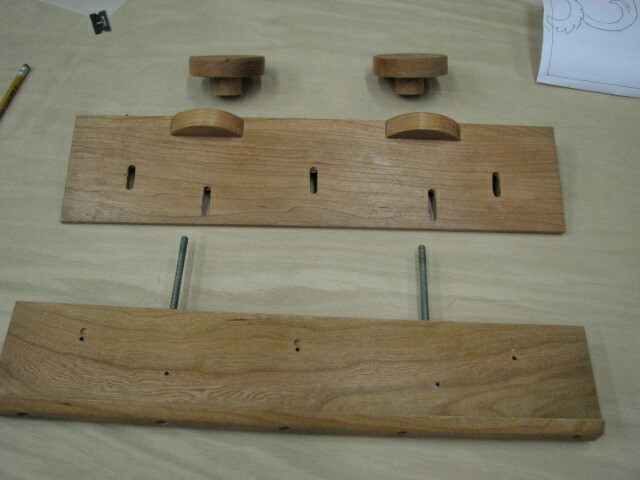 The slots in the table are for screws that will keep the table snug against the bed as the screws aren’t tightened securely but just enough to keep the table against the bed. 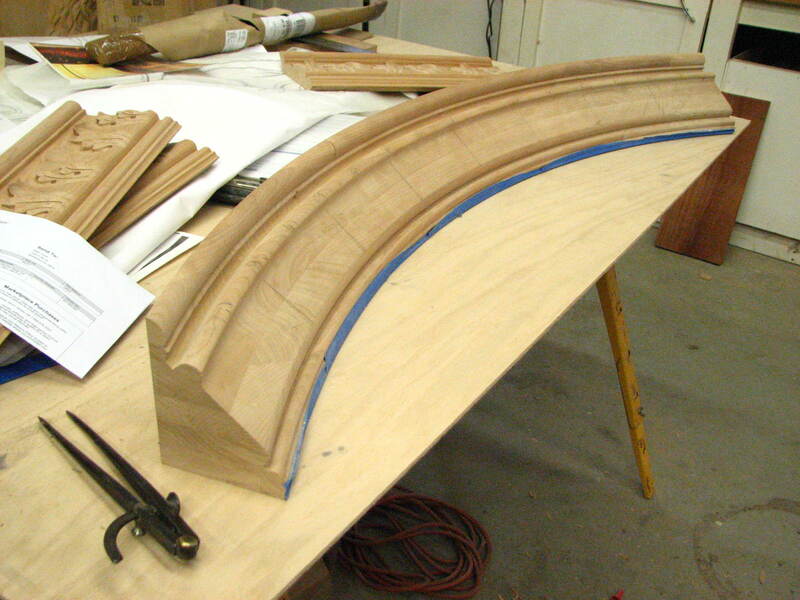 The side view might clear things up a bit as you can see how the two pieces now fit together with the small trough along the front is where the moulding will be inserted and clamped in place once the wheels are spun on the threaded rod. 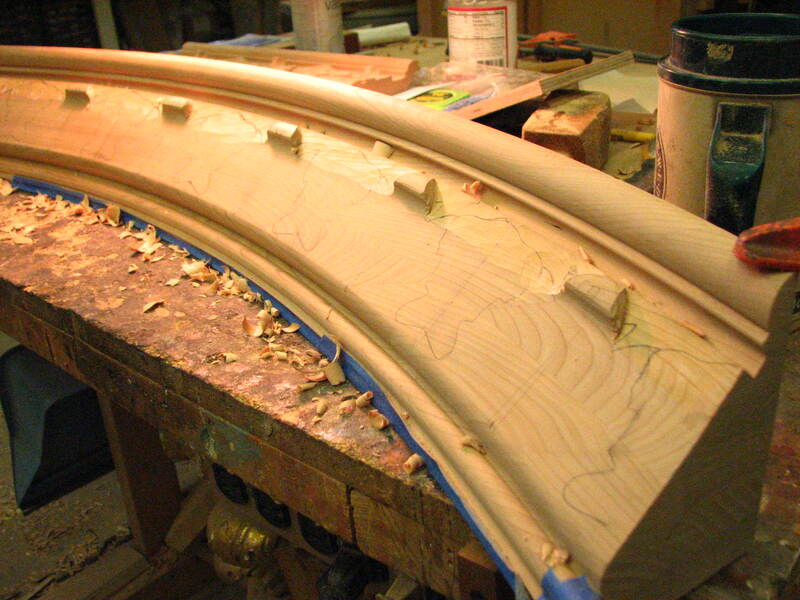 The smaller piece of moulding has been put in place and by turning the wheels gets clamped tightly in place. 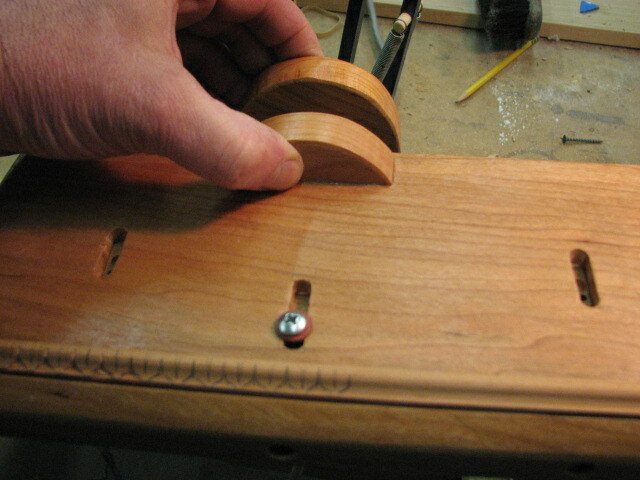 These small pieces of wood act as thumb catches to allow me to slide the table to release the mouldings. 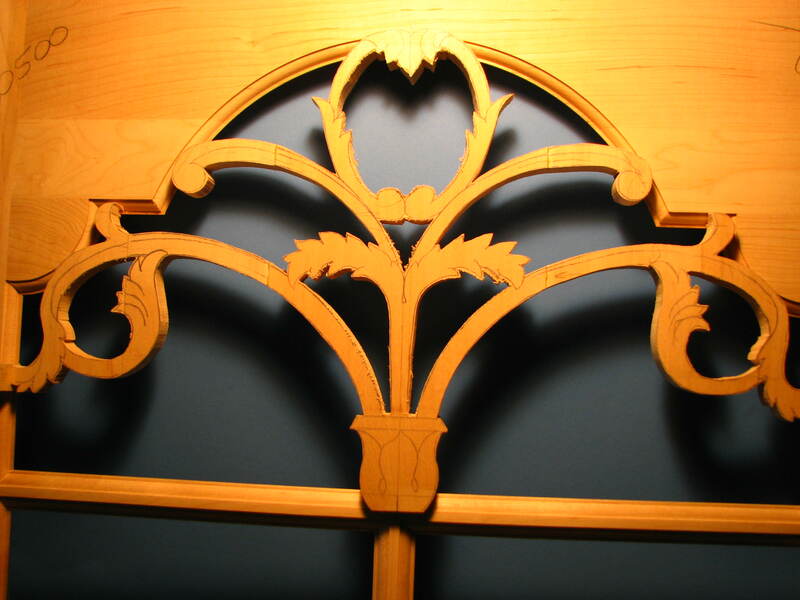 The screws aren’t put in tightly as they merely act to keep the table from lifting from the bed. Since it’s a bit snug the thumb pulls come in handy after releasing the tension from the wheels and sliding the table back a bit. 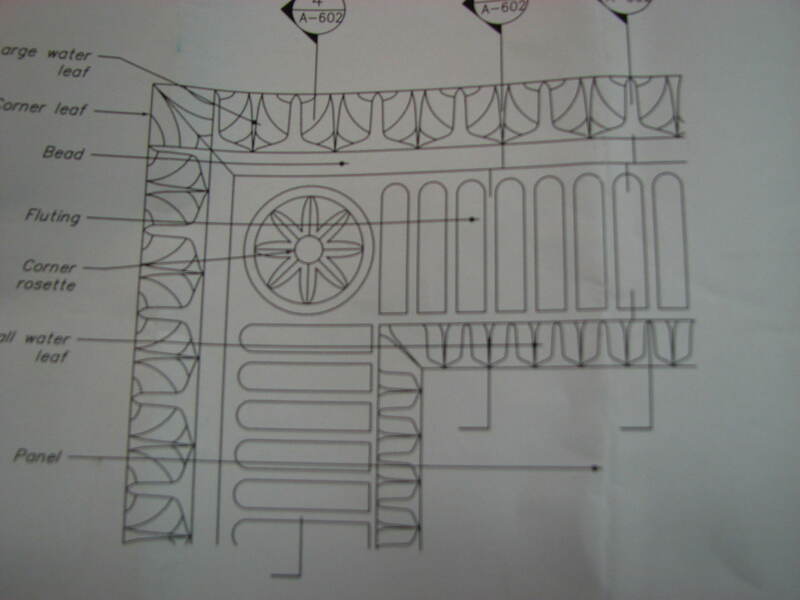 The aluminum template for the smaller piece of moulding. 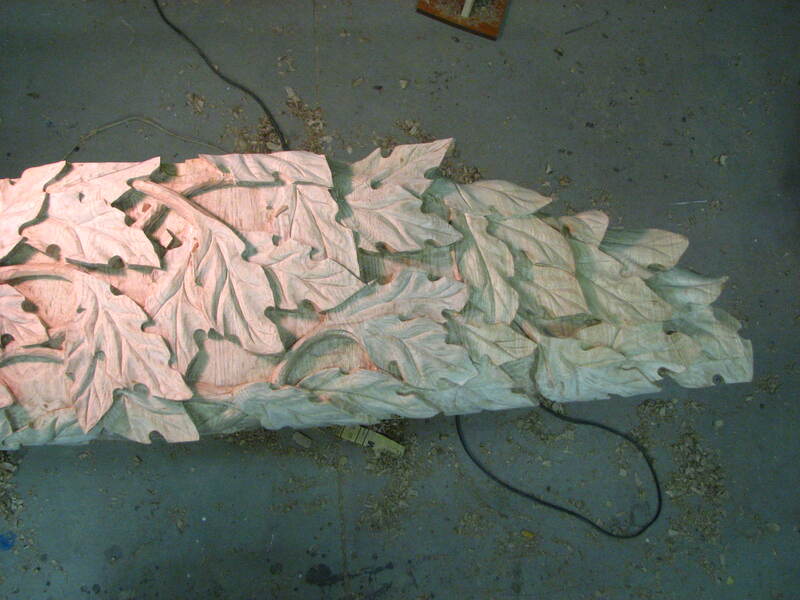 All totaled there will be approximately 22,000 of these small leaves that will need to be carved . 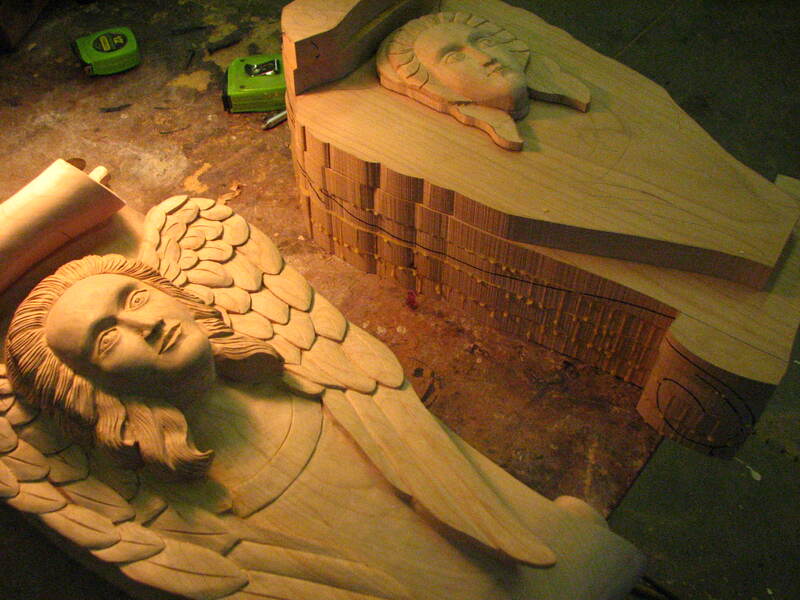 Slightly blurred but you can see the size of the mouldings and how small the actual carving will be. 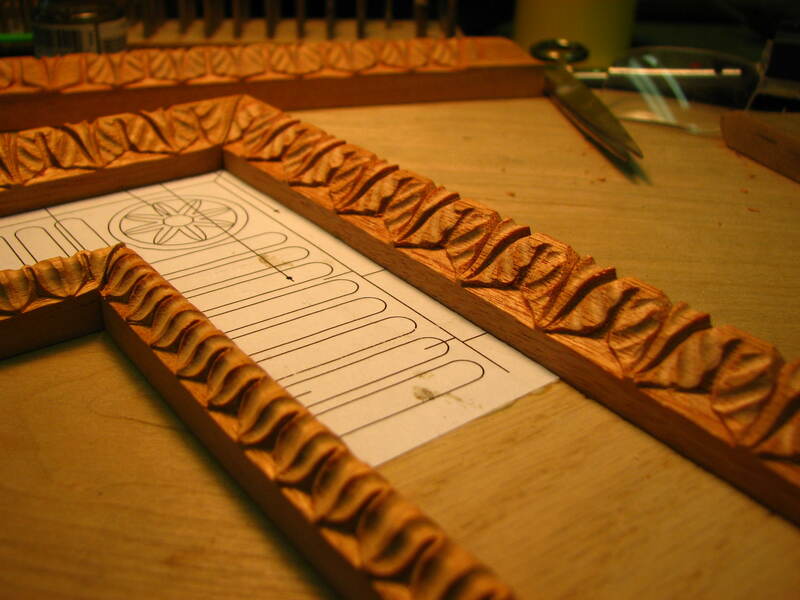 The template for the larger moulding is show here along with how the template can easily transfer the design to the strips of wood. 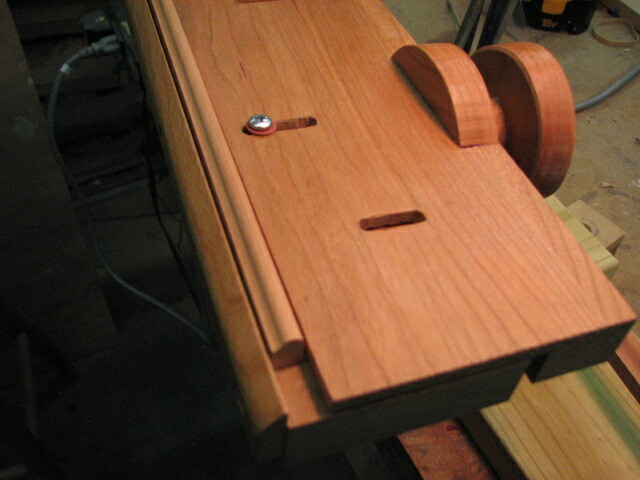 I mounted the vise to a swivel base so I can tilt it to the ideal carving angle. Doing 1180 ft of moulding comfort , ease of accessability and speed are very important. 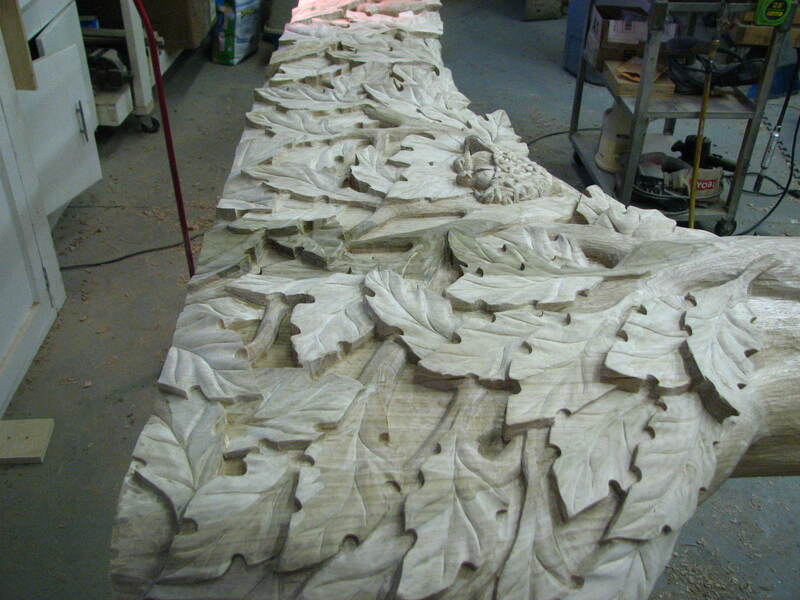 Here you can also see that there are no obstructions to get in the way of carving. 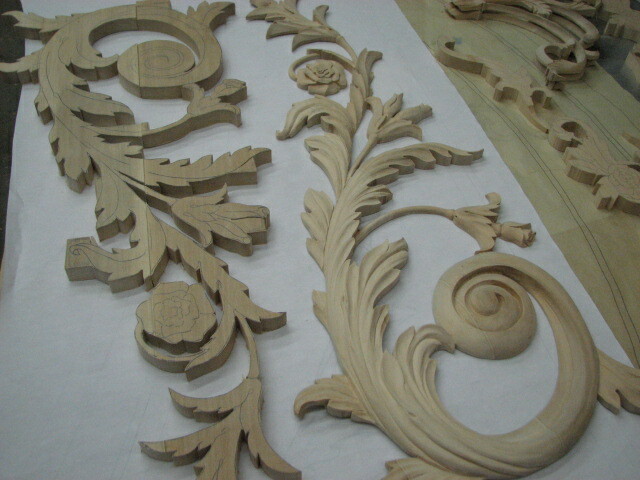 A close up of each of the mouldings and you can see that the large (?) 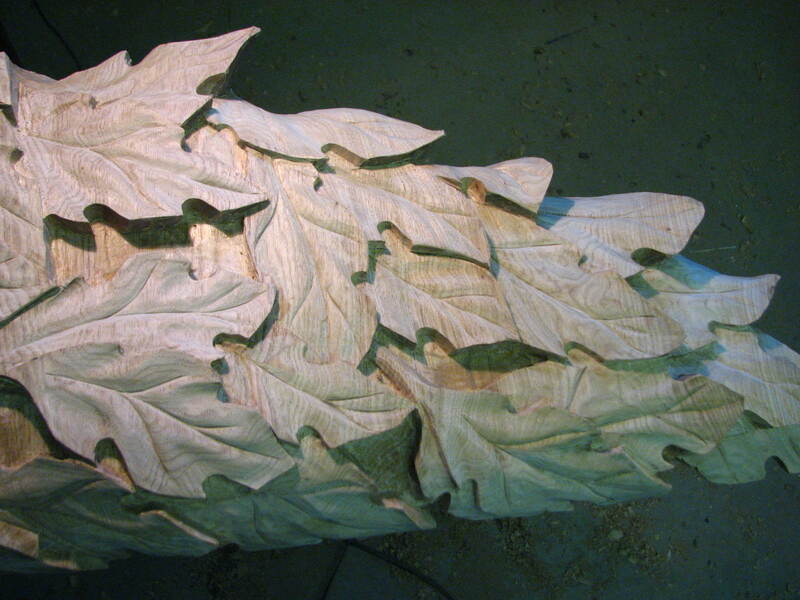 leaf design is about the size of my thumbnail! 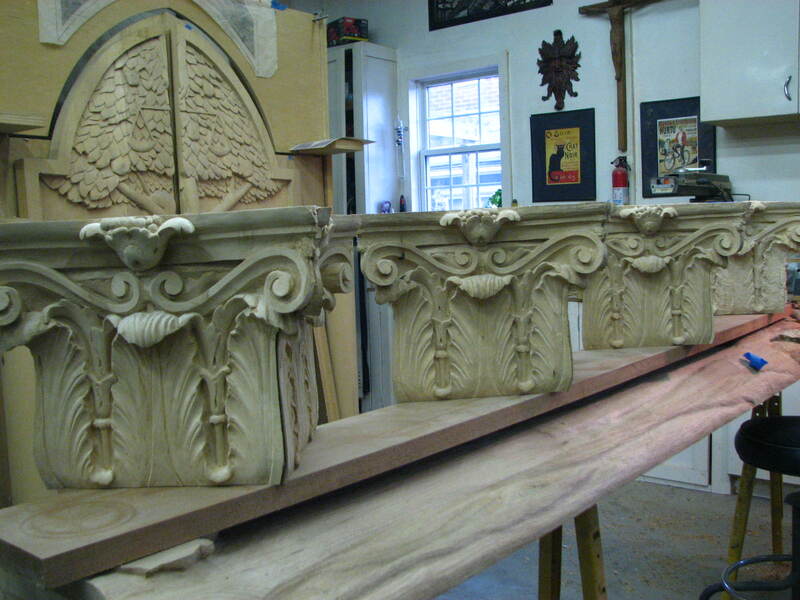 Various angles of the sample I carved. 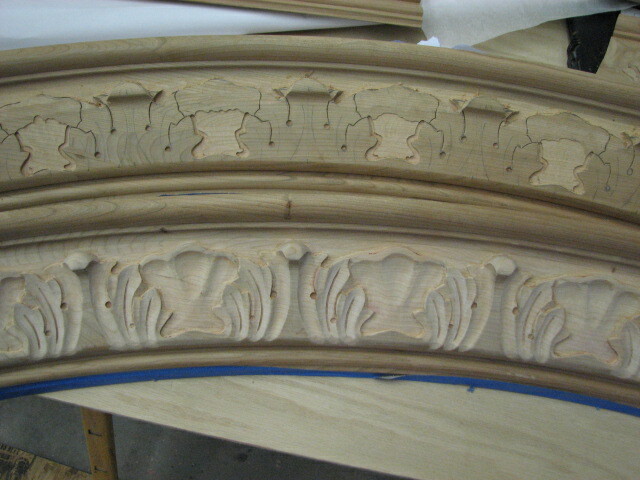 I used a cut out of the design they sent to fill in in between the two pieces of moulding just to get an idea of what it will look like. 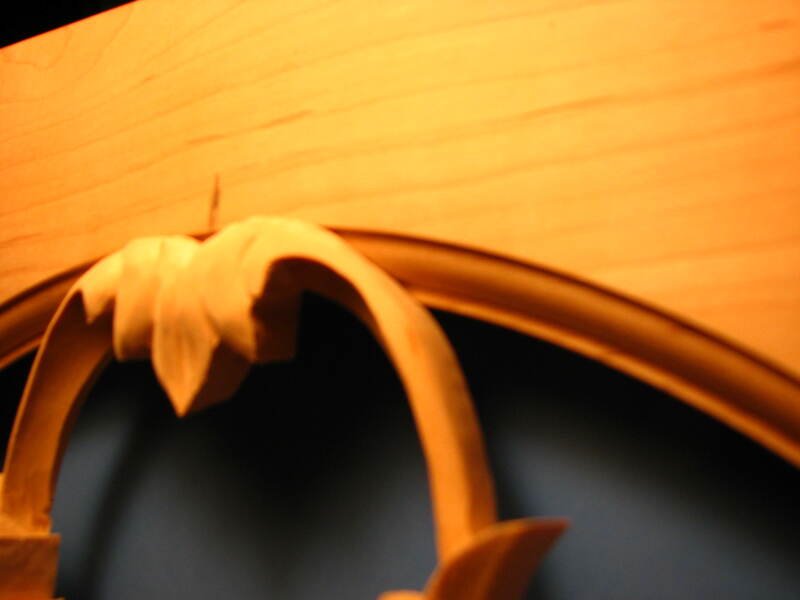 Another thing to consider is that the runs will not all be equal so the design has to be adjusted over its length to allow for miters and variations in length and still have each corner end up looking perfect and have all the spacings the same. 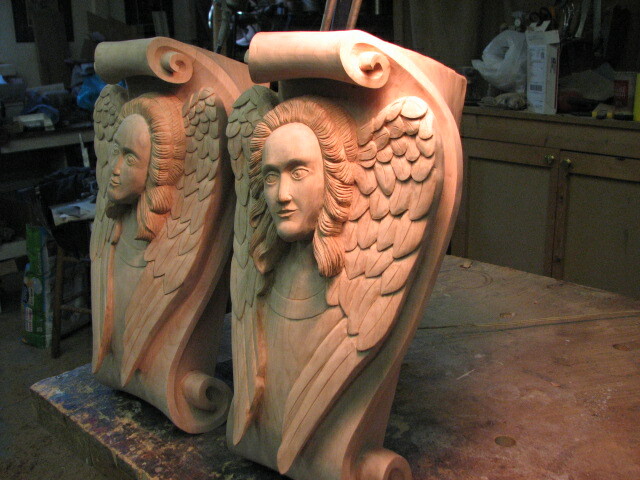 I’ve been under the gun to get these carvings done so I don’t have any “in the process” pictures. My concern was to just get them done as quickly as possible. Hopefully you’ll still enjoy looking at the finished pieces. This is a sketch I did for approval. The one on top is the one the designer sent which I just couldn’t use for obvious reasons! 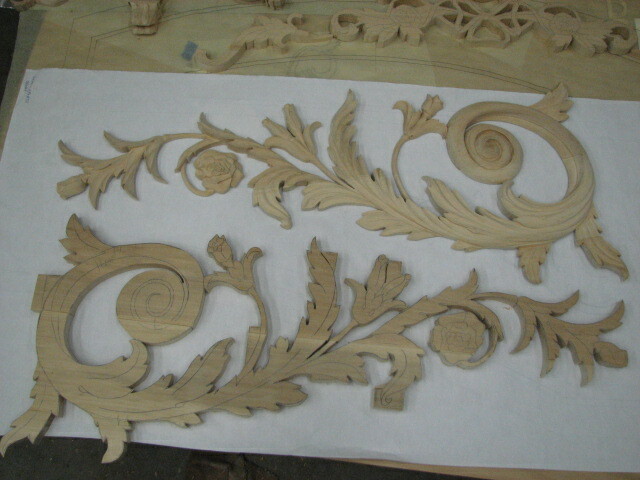 Here you can see one is just band sawed out and the other is carved already. 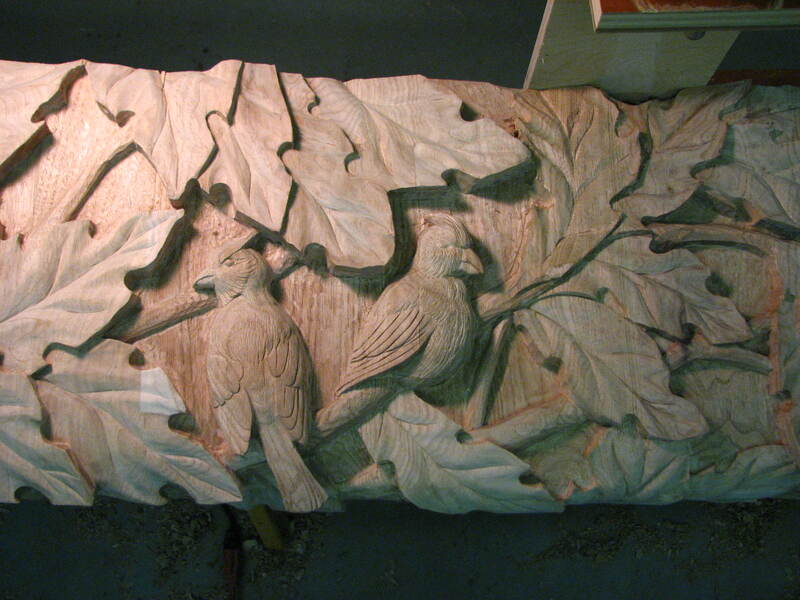 A close up of the sawed piece and the nearly finished carving. 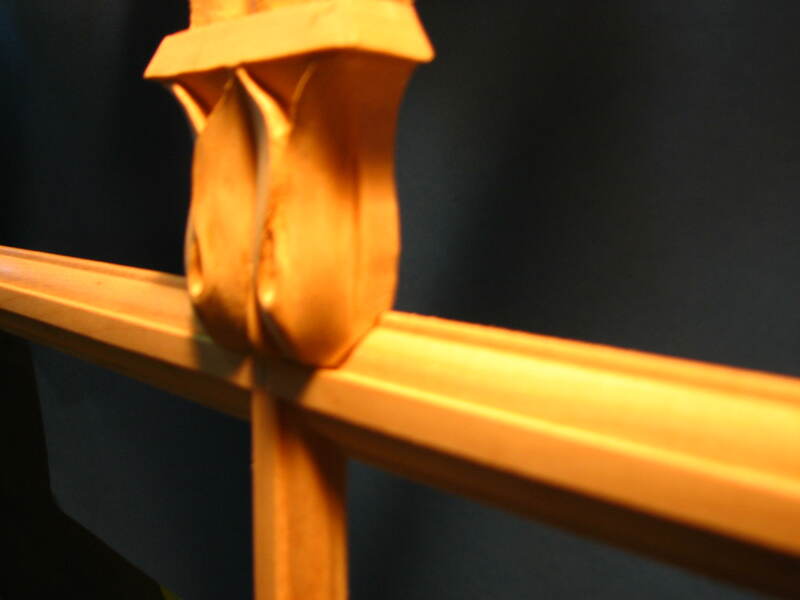 An angled view of the 3ft. 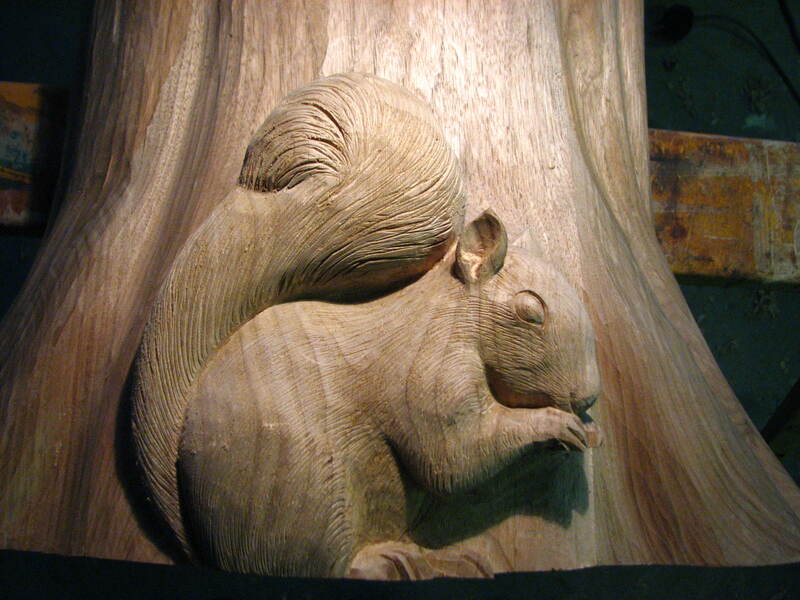 long carving. 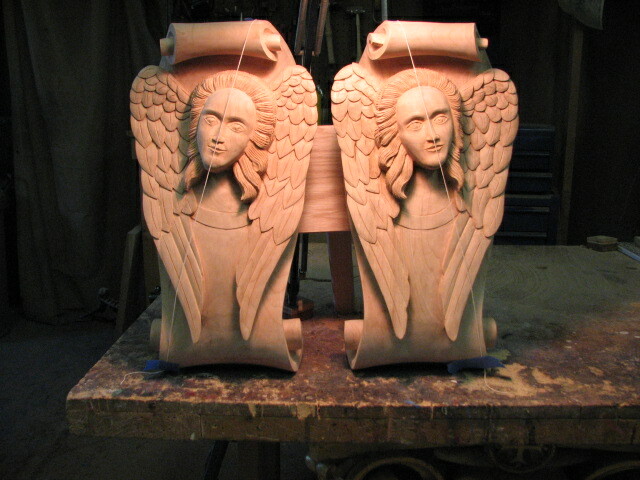 Photos of the completed pair of carvings. 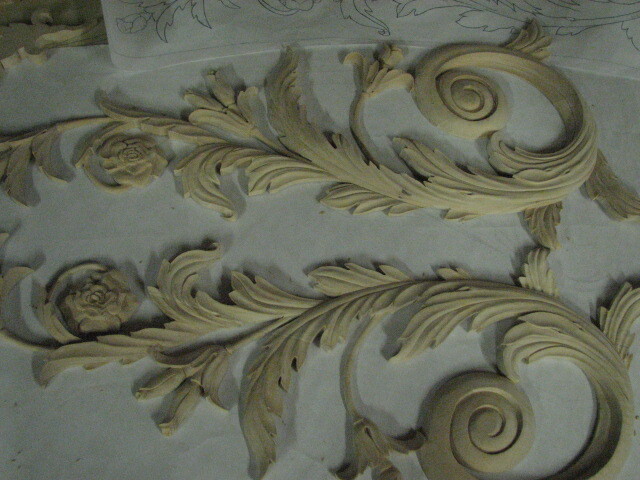 These were done in Basswood as they will be painted and given an antique glaze finish which will highlight the carvings nicely. 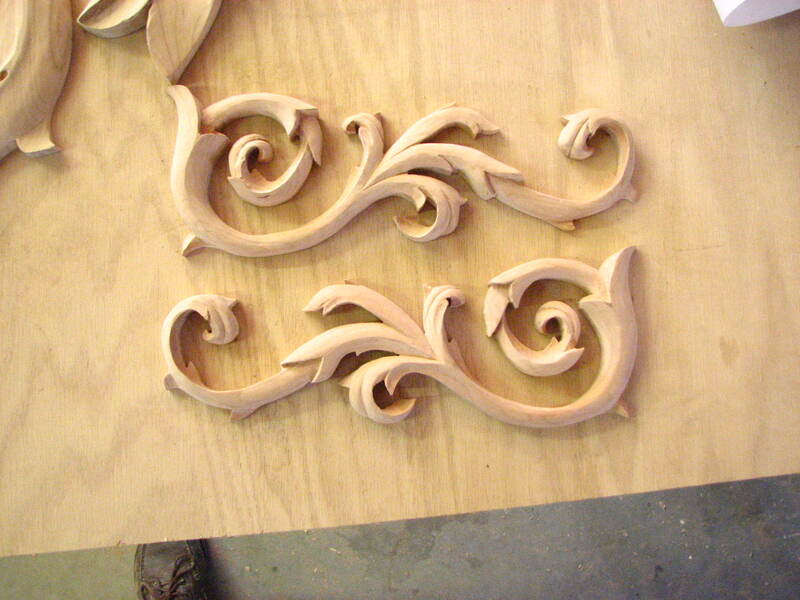 These were done in 1 inch stock. 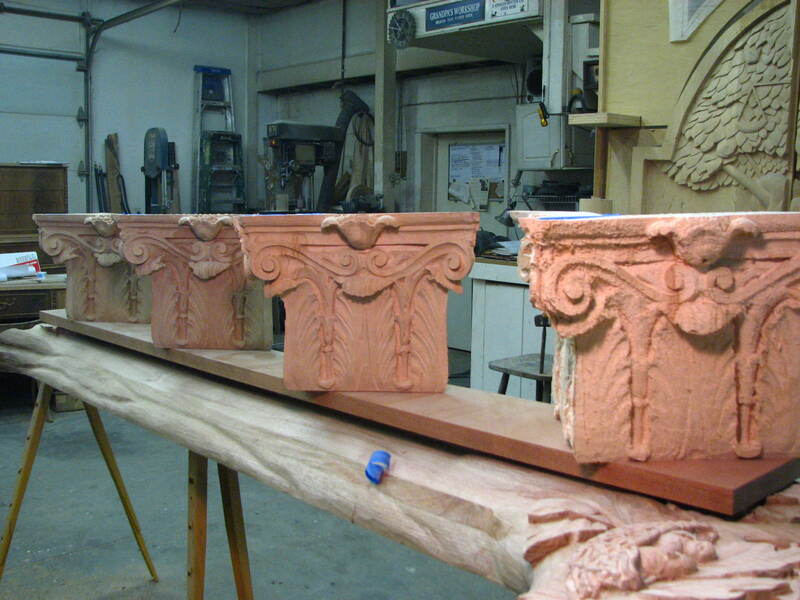 These are just a small part of several carvings for this job. 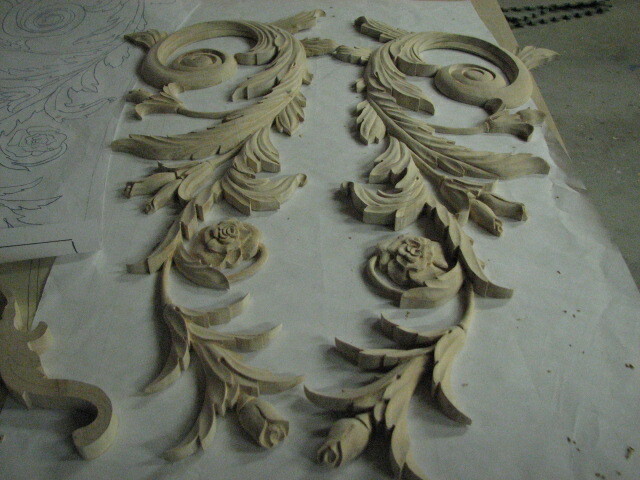 The Acanthus leaf carvings will finish off a pair of doors for a kitchen cabinet installation. 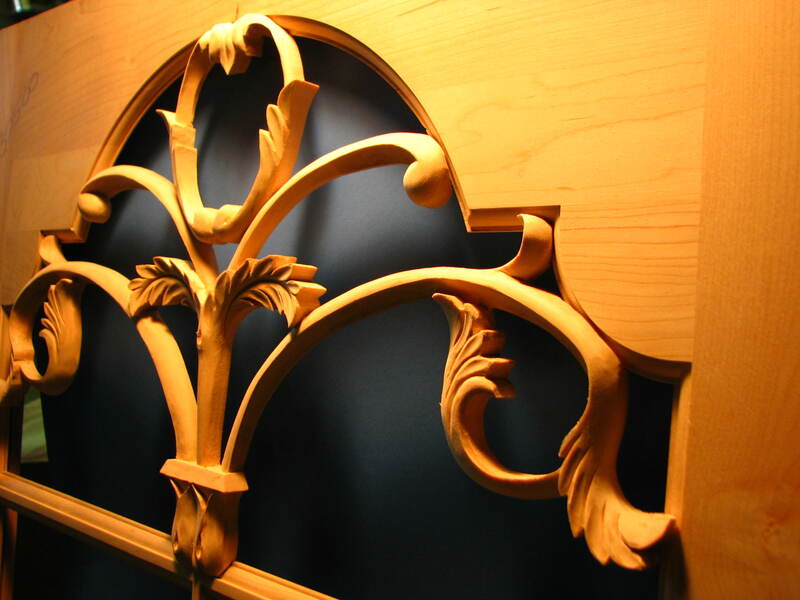 It’s a very traditional style design which really defines a door panel. 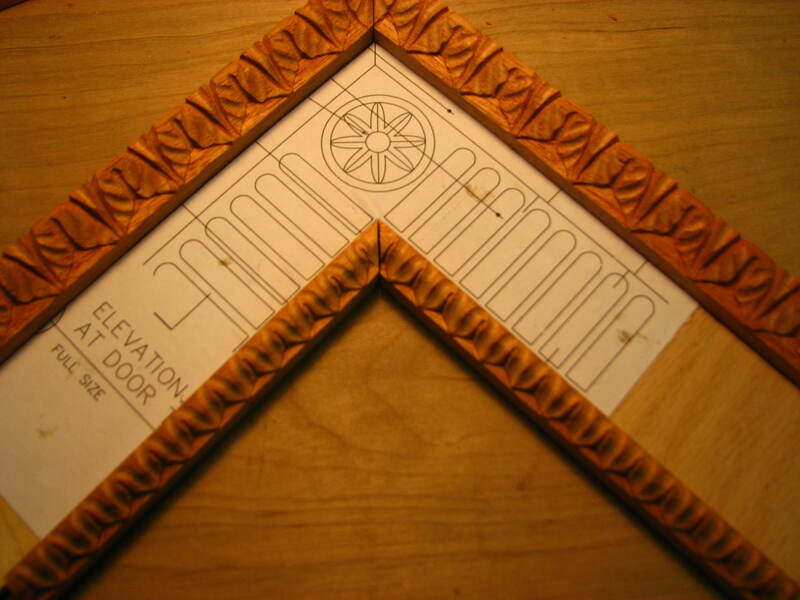 I did these in Basswood as the doors, and kitchen , will be painted with an antiqued glaze finish. 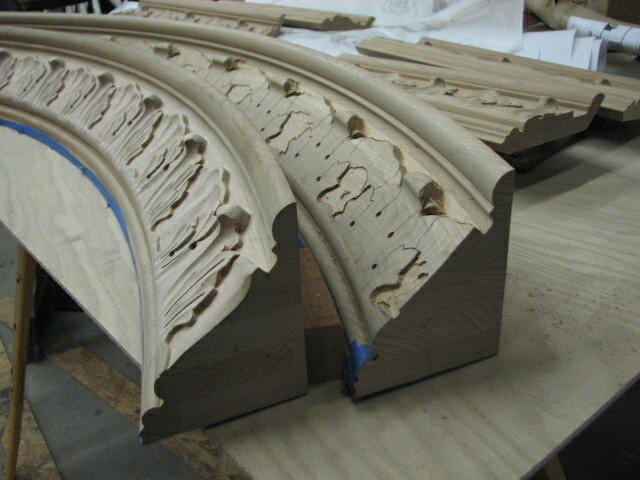 The thickness of the mullions was 1/2 ” from the surface of where the glass will be to the face of the door itself. 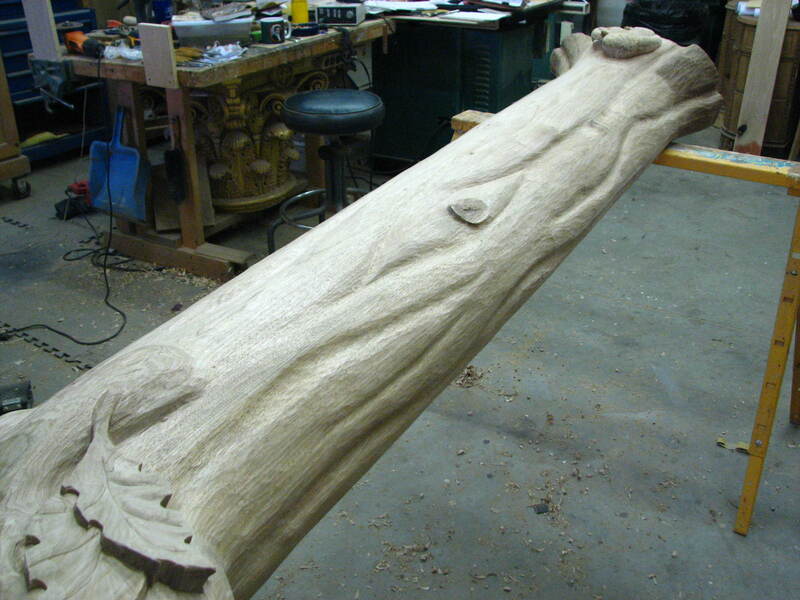 Not much room for carvings but they worked out just fine. 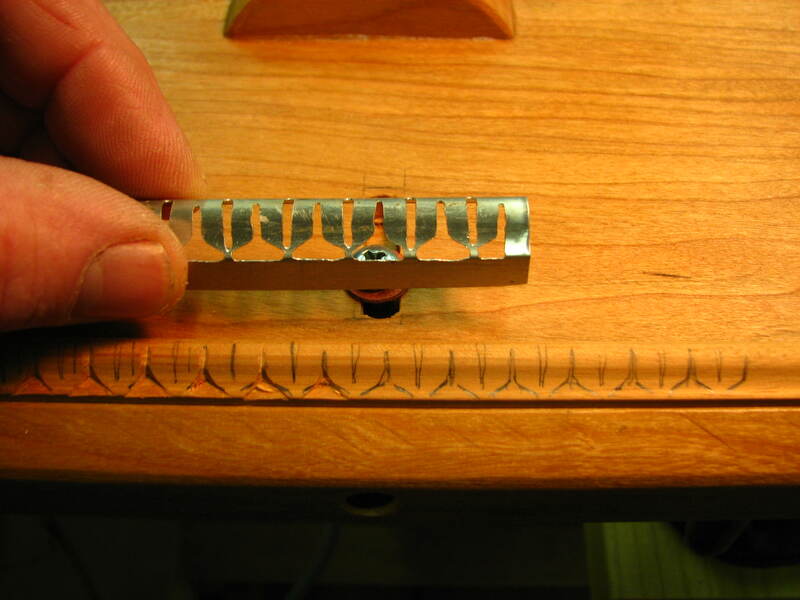 The thinnest section is 1/4 inch and the thickest is just over 1/2 inch. 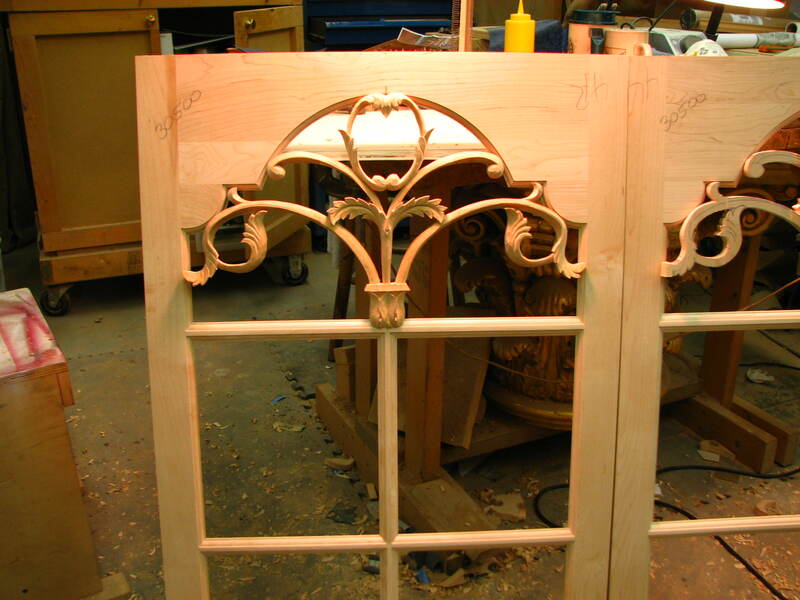 Since these have to fit into the door frame the trickiest part was to get the 8 points of contact to fit perfectly to the ogee shaped molding around the perimeter of the opening where the carving is to fit. Cut , trim, fit, cut , trim , fit, over and over until each piece fit perfectly was the order of the day. 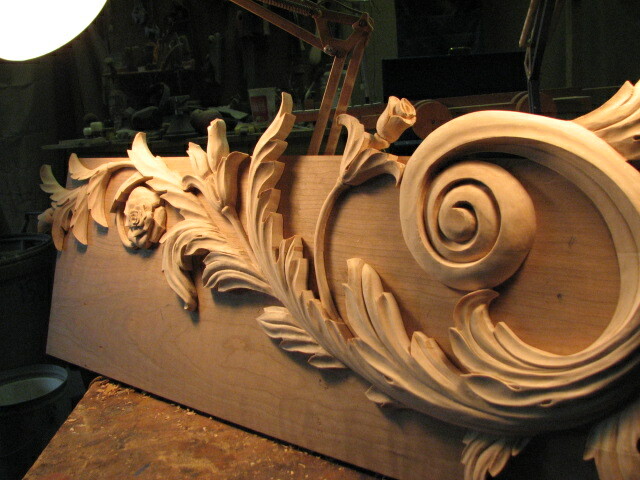 Though the carving is roughed in at this point you can see the fitting necessary where the carving meets the ogee shape around the perimeter. 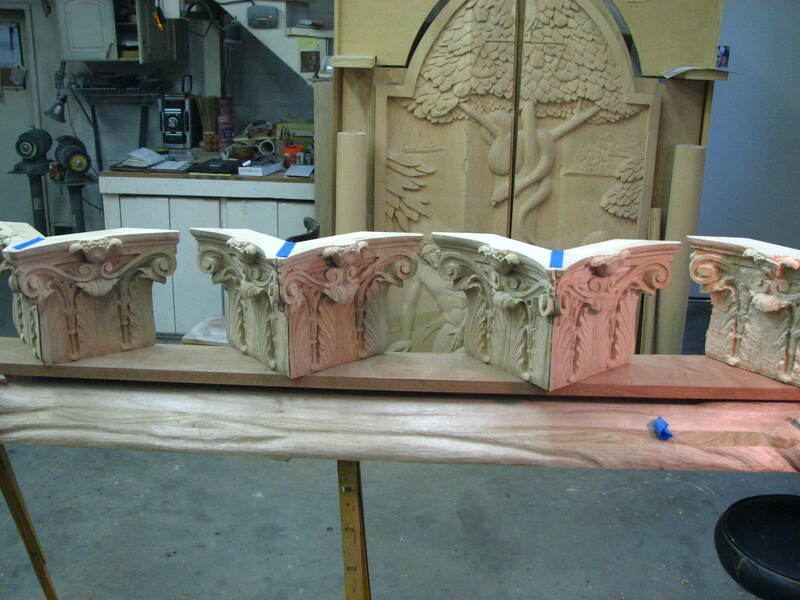 The carvings are roughed it at this point but are starting to take on a delicate look. 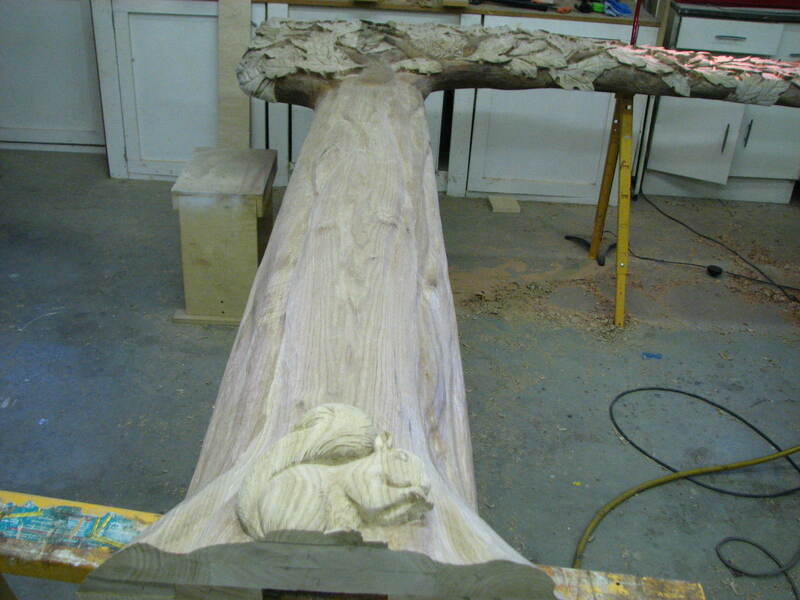 The carving is completed with just a bit of sanding needed here and there. 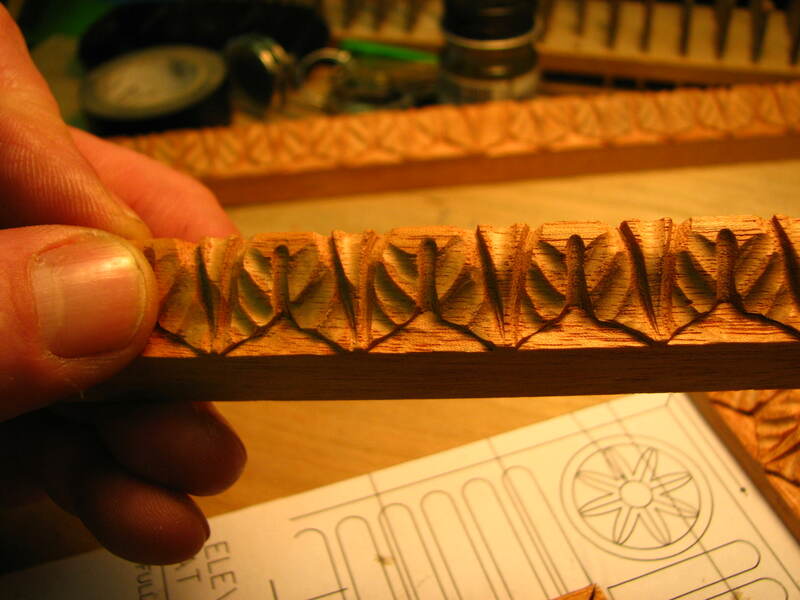 For a carving just averaging 1/2 inch it took on some nice movement and depth to the look. Tree part 5. It’s done. I got the tree wrapped up a day or so ago. But as is usually the case I keep picking at it until it gets shipped. As it stands there are just over 100 leaves and I have to admit that at this point I don’t want to see any more for a while! Here are a few random shots for you to see. I think that at this point you can find your way around the tree so it will be just photos. Here is the remnants of an ongoing project that was on,, then put on hold, then off, and now ( after nearly a year) they want to start up again. If you buy a ticket, then get off the ride you can’t get back on at the head of the line. Unfortunately that’s where this job ended up. At the end of the line. I can’t very well stop other projects already in the works since the time they cancelled this job several months ago and put current projects on the back burner. The freight train keeps rolling along and it doesn’t stop. But I thought you might enjoy seeing some of the other things I had been working on . A shame as they were coming along nicely until the plug got pulled. All that work……….. 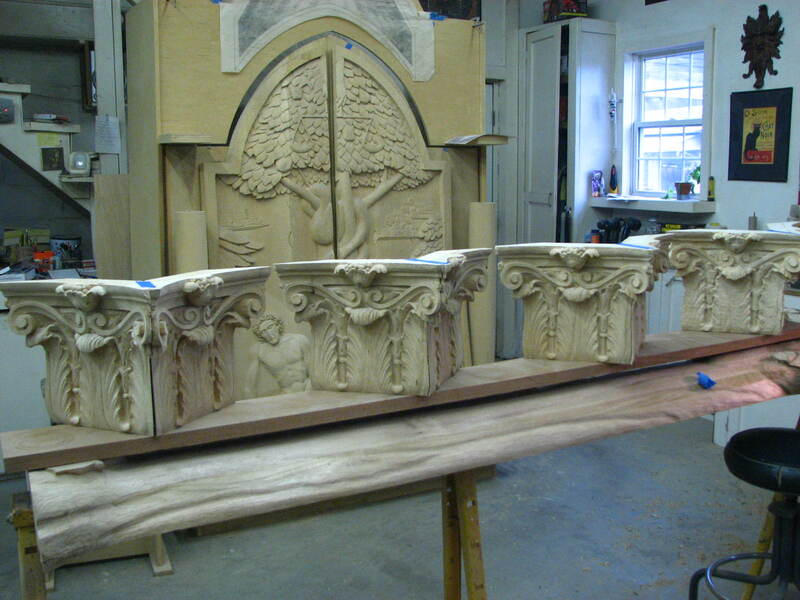 There are a total of 8 panels which will form two capitals. Here they are just mocked into position . The first one in this row is out of the Duplicator and hasn’t been cleaned up yet.